Nadina is the Director of Maarnada Studios, Gallery and Sculpture Garden. She launched her husband Maarten's Art career in 199l and the couple continue to work together. Maarten creating sculptures and Nadina creating stories. Nadine Agnes Stewart Schaddelee was born and raised in Victoria. B.C., Canada. 1990-1993 Nadine became a member of the CARTEL (Centre for Assessment Rehabilitation and Enhanced Life Style) team of outstanding professionals. She was with Cartel for three years as well as a coordinator of the fitness club for SMUS, with Cartel at the Racquet Club. Nadine's fitness accreditations include B.C.R.P.A. fitness instructor, and trainer of fitness leaders. 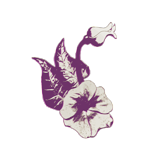 'ALTERNATIVES IN FITNESS' was the company Nadine created for Lifestyle Fitness... Body Mind Emotions Spirit...she worked as a Speaker - Seminar Leader - Consultant - Trainer. which included "Wellthy" Workplace. Studying Eastern Wisdom of relaxation techniques, reflexology, massage, and obtaining certification as a teacher in Tai'Chi Chih enabled Nadine to balance the best of Western and Eastern tools in stress survival. Trained with Linda Kavelin Popov of the Virtues Project and practices the Art of Spiritual Companioning http://www.virtuesproject.com/profiles.html It was at a workshop by Linda, when in a guided meditation Nadine's future self came to her and introduced herself as Nadina. It brings the first and second name together. Nadine means Hope....Agnes means Sacred. Her name means Steward of Sacred Hope. In 1994 Nadina authored the book "Insprations From Maarnada". Learning to Sail - "Power Squadron" training. In 1999 Nadina and Maarten journeyed across Canada to deliver a sculpture in Nova Scotia for the Robert Pope Foundation. http://humanities.medicine.dal.ca/pope_foundation.htm They fell in love with this amazing country of ours and wanted to give something back. On Earth Day 2000 'Millennium Peace' was installed at Clover Point overlooking Victoria's Waterfront. A Touchstone of Peace for the New Millennium link. As a Mother of two boys Trevor and Troy she loved her role being in home management, counseling and care giving. Nadina's family enjoyed sailing during this time. Nadina received her sailing certification as well as her Power Squadron Training and loved sailing all three of their sail boats. 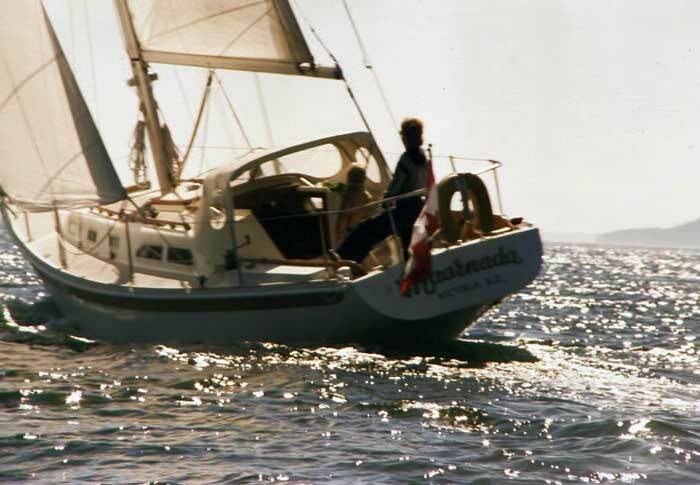 Their last family sail boat was an Erickson 35 foot beauty that they called Maarnada. When the boys were older and needed her less, a serious full-time career in wellness education became her passion. Nadine delighted audiences as part of the famous Jerry Gosley "Smile Show" British Music Hall. 1967 - 1969 A successful business background started at the B.C. Hospital Insurance Service from where she moved to one of the first extended care facilities, St. Mary's Priory Hospital, as part of the administration team. It was there during the innovation of rehabilitation with the bedridden elderly that Nadine realized it was never too late to improve the quality of life. The support and guidance of 'The Sisters of the Society of the Love of Jesus' who ran St. Mary's Priory was a great gift of feminine spirit and compassion. A successful business background started at the B.C. Hospital Insurance Service from where she moved to one of the first extended care facilities, St. Mary's Priory Hospital, as part of the administration team. It was there during the innovation of rehabilitation with the bedridden elderly that Nadine realized it was never too late to improve the quality of life. The support and guidance of 'The Sisters of the Society of the Love of Jesus' who ran St. Mary's Priory was a great gift of feminine spirit and compassion. As a Mother of two boys Trevor and Troy she loved her role being in home management, counseling and care giving. Nadina’s family enjoyed sailing during this time. Nadina received her sailing certification as well as her Power Squadron Training and loved sailing all three of their sail boats. Nadine became a member of the CARTEL (Centre for Assessment Rehabilitation and Enhanced Life Style) team of outstanding professionals. She was with Cartel for three years as well as a coordinator of the fitness club for SMUS, with Cartel at the Racquet Club. work together. Maarten creating sculptures and Nadina creating stories. All rights reserved, reproduction of these stories or images prohibited in any form without written permission of the owner, Nadine Schaddelee.